Looking to expand your restaurant or cafe's selection of sugar and sweetener packets? Sweet'N Low is a popular sweetener of choice, especially for your health-conscious patrons or your guests with dietary restrictions. This saccharin sweetener has a pleasant taste with fewer calories, no carbohydrates, and no fat. In fact, Sweet'N Low has less than 1/4 of the calories that regular sugar has. Each 1 gram pink packet sweetens like 2 teaspoons of sugar, making it a great substitute to save on sugar costs. Great quality. Easy to use and store. Appropriate for all serving and catering needs. Highly recommended. We use it for our food serving needs in the store. Awesome value for the name recognition that our customers are looking for in our cafe. Great size packets to add to our selection of sweeteners available. Perfect for iced tea and other beverages. We use these in our stores and restaurants and they are well known. Great price for such a large amount. Perfect size sweetener for 12 oz cups of coffee. They store well and we had 0 broken packets. The flavor is great and it blends in well. In my opinion, much better than the generic brand. We keep this, as well as splenda on hand and our customers notice when we are out. Great experience with WebstaurantStore, very good product, quickly shipping, everything perfect. I will buy again soon. Thank you so much.!!! I have used Sweet-n-Low for over 40 years. I have tried all the others and do not care for any of them. Using one packet of Sweet-n-Low gives me just the right amount of sweetness. It takes more packets of the others to give me the same amount of sweetness. Equal takes two and Splenda takes 3. 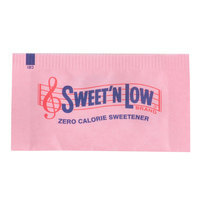 The Sweet'N low sweetener is terrific and is great for our diabetic guests. The sweetener tastes great and works well with any beverage. It incorporates well and no clumping. Love sweet‘N low sweetener?It is very good price and can beat anywhere?And a lot of people eat heathly will choose this sugar for coffee and some else? My box arrived smashed but other than that sweetner is sweetener. Decently priced with free shipping. This will be on my reorder list as long as they all don't come smashed. Product was as described. Everything was in perfect condition. The product works great with coffees and teas per my customers! For an artificial sweetener I would buy it again. A Sweet N low a great product for diabetes. Very delightful and very pleased with the quality and taste that substitute of sugar.. This a very tasty products. This is an inexpensive sugar alternative for your customers. We use this as an option in our to go station for all our coffee lovers. You cannot beat this price on the Sweet n low packets. A lot less expensive than our food vendors. We use a lot of this in our restaurant. This Sweet’N Low zero calorie sweetener is a great alternative for customer with sugar diet restriction. They can still have an opportunity to enjoy their cup of coffee or tea without worries. A lot of people still prefer this classic sweetener over Equal or Splenda. We always have it set on auto ship because we go through so much! Great value product! The 2000 case is perfect for our coffee and tea shop. It lasts a long time and our customers are very happy! Webstaurant packaged all the of sugars together and it was very convenient when checking things off the invoice as the delivery drivers dropped them off. Will be ordering again soon! Sweet and low is such an excellent sugar alternative. It's nice to have this as an option when I go out to eat for tea or coffee. Just what we we're looking for. We've been buying from a whole sale club, but this price is much better! Box and packets arrived in good condition and just as described. Came packaged well..and for our small coffee shop this should last a LONG time. Great deal on prices compared to others on the web though. These are a good sugar substitute. The Sweet 'n Low brand name is a well recognized one. It is good for those picky people to see it printed right on the package. The other brands are good too. Great price on this item in comparison to what other places charge. I feel like this sweetener is pretty much standard in most places. Good value. Good price on a favorite item. Much cheaper than purchasing in other stores, and product came very quickly. Packaging was appropriate for size of item. Many customers this particular product and it tastes better than other brands.. Webstaurant offers it for a great price. A sugar substitute. Use in moderation. These sweetener packets are so convenient to have. We don't go through very many of them, so it is nice to have them in the individual packets. A great way to buy! The price is fantastic. This is a good brand name to offer people as a sugar alternative for coffee and tea. Great taste and great product. I have been using Sweet'n Low since I was in the army in 1988. So for me there's no other sugar sub that I would offer. Great deal on the 2000 case. We offer these packets in our coffee shop for a sugar option. Customers really like this product. Great price and quantity. always ships quickly and damage free. These packets of sweetener are one of my favorite. Each packet is about 0.03 oz. The packets arrived without any damage, and I am satisfied with the price too. Great product. Great price. So much easier buying by the case than buying them at the grocery store. Will continue buying this product from Webstaurant!